Used/Secondhand Office Furniture At Affordable Prices! Whether your company is a startup or an established business, you need to take several factors into consideration. First, cost. Even if your business has been around for a decade or more, you’re not going to spend unwisely, even though a few employees have urged you to buy those uber-expensive desks. From the simplest paper questionnaire to a full-on online survey, you can obtain so much information that you need before you make your final decision. This survey will help you get all that information – what your employees need, versus what they want, like the outrageously expensive desks. You’ll also learn what has or has not worked with the furniture you currently have. Because you’re buying secondhand office furniture, you’re going to have to deal with a few (okay, more than a few) concerns. When your staff learns you’re choosing secondhand furniture, they’re going to bring concerns about exposed seat stuffing or rickety desks falling apart with the weight of a mere laptop. This is when you explain that you’re choosing refurbished or re-manufactured office furniture. Above all, let everyone you want your office to look as professional as possible. Budget. Money. Bank account. Need to save. You keep reminding yourself of this when you see the prices of new office furniture. Whether you need to answer to a board of directors or the CFO, you’re focused on two things: You don’t want to deplete the company’s bank account. . . but you also need to find attractive, sturdy furniture that helps your business to communicate its brand. This becomes even clearer when you remember you need X number of desks, X number of chairs, Y number of filing cabinets. . . you get the picture. Trying to shoehorn a massive, executive desk into a small cubicle is an exercise in insanity. It isn’t going to happen! Break out the tape measure, pad, and pencil and physically measure every office or cubicle. When your managers say they “need” those outsized desks, remind them that they need to put other furniture into their office, as well as move around without breaking toes in the process. By “flexibility,” we’re talking about office furniture that can multi-task. Can your workers store files and notebooks in their desks? Or will they need storage cabinets? If so, look for desks that allow for storage. Is every desk you’re looking at easy and comfortable to use? If not, keep looking. As you’re looking for the best furniture at a livable price, don’t forget about flexibility. It’ll take your company much farther. Ahh, the huge desks. As you are looking at them, you realize the reason your employees were pushing so hard for them. They are brightly colored! So “today, hip and trendy. . .” So soon to be outdated. Besides, their color means they may not fit in well with your company’s brand identity. Stick to your decision and buy only what you know will fit in aesthetically. Come visit us at Cubiture and we’ll show you our stocks of secondhand furniture. 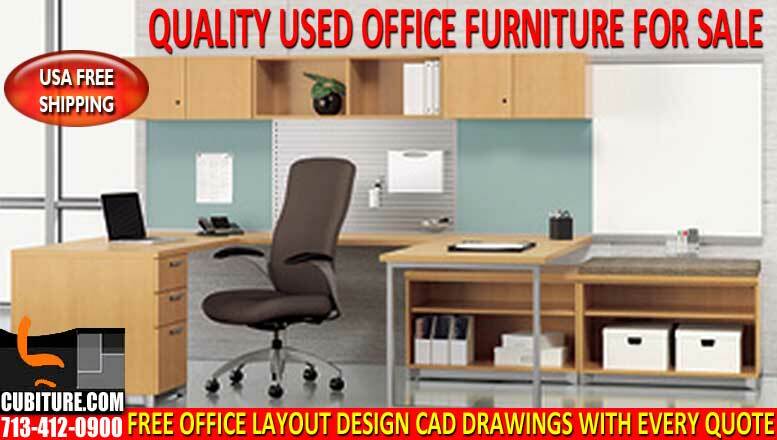 Browse our office furniture and choose used. Call Us For A FREE Secondhand Office Furniture Quote 713-412-0900.